The idea of tickets had bothered me for a while. We all understand ecommerce - you go to a site, choose a product, give them your credit card details, and a bit later a brown cardboard box arrives at your house. Simpler still is buying a virtual product, like a music download - from the site to you straight away. In the world of travel and entertainment you're usually buying an experience - a night at a hotel, a flight, a theatre show, a film at a cinema, a spa treatment, a meal in a restaurant. This is where tickets come in. The site delivers you the ticket, you take the ticket to the supplier, you get your experience. Often the ticket is a physical bit of card or paper, but more recently there are electronic tickets - emails, barcodes, perhaps on your mobile, could be a mobile boarding pass - still serving the same purpose. The customer has evidence for their purchase, and so does the supplier. Sometimes you get the ticket send to you, other times you can collect it at the venue - so you arrive, prove you are the ticket-buyer, collect the paper ticket from one desk or get it from a machine, then hand it to someone else a few yards away, and in you go. Othertimes there is no ticket, they just rely on identifying you when you arrive - like with a hotel or restaurant booking. Sometimes you take your ticket to the check-in desk, and exchange it for a boarding pass, and then give that in to someone at a different desk an hour later, except a little stub they'll let you keep. And in each of these industries, where they have a well established but unique way of dealing with tickets, they'll swear this is the way they've always done it, this is the best way, it would be so hard to change it. We always need the guy to tear the ticket in half as you go into the cinema. But the restaurant? No ticket! What a ridiculous idea, a ticket for a restaurant booking. On the flip side, a city like London has a lot of unused capacity. Cinemas aren't always full, restaurants aren't always full, even theatres aren't always full. We wanted to help the venues sell any remaining seats, right at the last minute - this was a project harking right back to the origins of lastminute.com. The ticket thing tended to get in the way though. And even worse, it distracted large numbers of people working on NFC (more tickets) or barcode scanning infrastructure (still more tickets). The real problem is creating the marketplace, the customers and the suppliers. 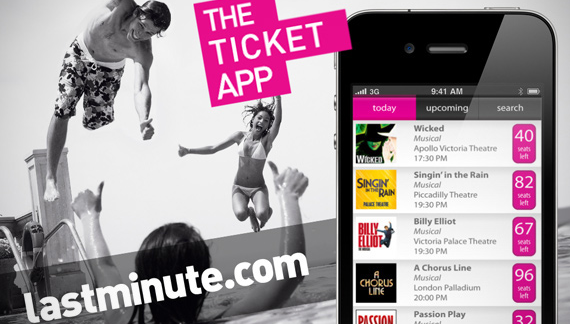 The Ticket App, or the fonetickets project, was a big team effort to create a disruptive new distribution channel for theatre tickets (and eventually all kinds of experiences), right up to a few minutes before the start of a show, sold via mobile web. We realised that people bought cinema tickets without much pre-planning, but theatre was considered a big special occasion. However for a last minute seat the price was not that different. Could we persuade people to pop to the theatre as casually as catching a movie? It ran as a trial with several West End shows, together with the Ambassador Theatre Group. We recruited testers from the queue of customers waiting to buy tickets from our competitor tkts (the ticket booth in Leicester Square). We sat in theatre box offices and call centres making notes. This was the project where we fully embraced the idea that the technology wasn't the hard part, that ticketing mechanisms were a red herring, and that if we could just create the supply and the demand and match them up, the rest would sort itself out. I departed lastminute.com midway through the trials of this project so I don't know where it ended up, but I hope one day I can book tickets for a play on my phone a few minutes before it starts!